These foods have been proven, through years of use in different cultures and cuisines, and scientific study, to help with inflammation. That being said, everyone is unique and some people may not tolerate every food. Sometimes digestive issues can get in the way of absorbing food. Other times, hidden food sensitivities can wreak havoc on your immune system, when you’re trying to eat loads of a given “superfood” that you may have a hidden immune response to! So while all the recommended foods are generally good, everyone will also benefit from fixing any digestive issues, and addressing any potential food sensitivities. 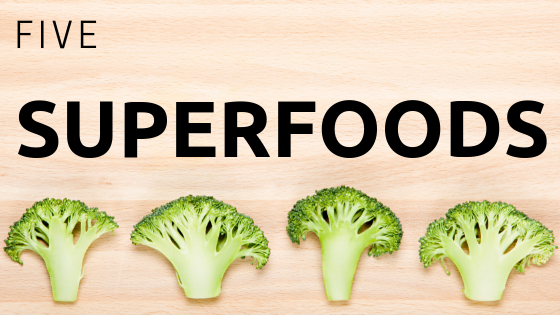 Broccoli or other cruciferous vegetables: high in phytonutrients that help fight inflammation and encourage good detoxification in your liver. There are different cruciferious vegetables (broccoli, kale, dark leafy greens, collards, cauliflower) that are in season all year- see what looks good at your grocery or farmer’s market. Berries: all the different jewel tones of berries contain anthocyanins, which are powerful anti-inflammatories. Plus, berries tend to be lower in glycemic load than other fruits, so they’ll have less impact on your blood sugar. Healthy vegetable fats: extra virgin olive oil, avocado, nuts… in addition to the healthy fats which can help fight inflammation, many of the good nutrients in the other food listed here are better absorbed with some fat! Omega 3 fats from fish: while salmon is best-known among the sources for inflammatory-fighting omega 3s, there are plenty of other, smaller fish that are more plentiful, including anchovies, sardines, and mackerel, which are more sustainable and less expensive. Always choose wild-caught fish. Pineapple: the bromelain in pineapple has been shown to help decrease inflammation, both respiratory and joint pain. Fresh pineapple is also a good source of fiber and potassium. Foods to avoid while on an anti-inflammatory diet: processed foods with sugars, refined oils or trans fats, fried foods, artificial dyes and colors! Need help figuring out how to eat anti-inflammatory? Come meet with our nutritionist for more information, including a detailed and personalized plan. Up ahead, part 3: favorite anti-inflammatory herbs and spices! You'll also get occasional emails from Dr. Hauser with healthy tips.